Over the last several weeks of time away, I found myself doing a whole bunch of reading, and one of the books in question was by the senior pastor of the local Southern Baptist outpost in my small town. The book came out of his dissertation, meaning it was a wee bit dense, requiring me to chase it with a bit of taut and profane hard sci fi, followed by a splash of Amish romance novel. My reading is nothing if not eclectic. Reading that dissertation reinforced a couple of things. First, for any oldliners still under the illusion that being nondenominational or...Baptist...might mean a lack of intellectual rigor, just a few moments with this work will disabuse you of that notion. Having spent time in conversation with my Baptist colleague, he's one of the few folks I know who'll drop German theological terms into conversation. Correctly, even. Second, while the focus of the dissertation was a now-obscure Westminster divine, the core theological exploration was actually still quite relevant. What does it mean for a thing to be true? And what does it mean to be "literally true?" 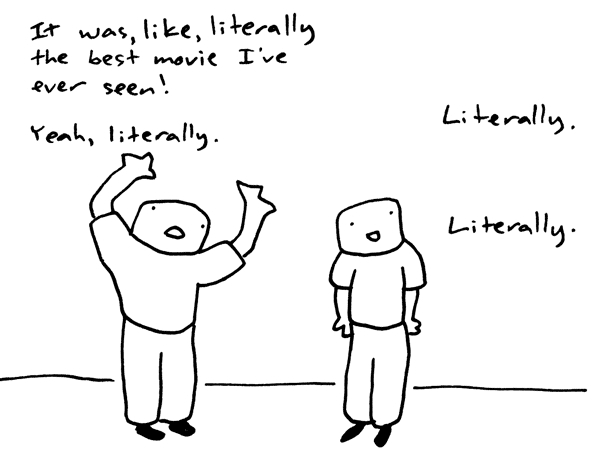 "Literally" is one of those words that is legendarily overused. It's become something of a filler word in in contemporary chatter, a tacked-on term used to emphasize the veracity of a statement. "I was, like, literally, like, so totally mad at her." "I literally fell off my chair." "I literally had a cow." Beyond the reflexive use of that term, given the root meaning of that word in English, this is a rather peculiar thing. "Literal" means having to do with the written word, and the meaning of language. It speaks to a form of truth that relates to the veracity of language, the degree to which our monkey-jabber and chicken-scratchings do or do not point to the reality we're using them to approximate. Which, of course, is the problem with that phrase as an affirmation of the Real and the True. Language, for all my love of it, is not tghe thing itself. "Literal" truth is a second order truth, a truth removed from the reality of things and the essence of being. Which is why "literal" is such a peculiar term to affirm the true.